The girls and I projected this on our living room wall, using the Toshiba + Optoma. Alexia fell asleep before it was over, Tara pronounced it a good movie and not all that bad, given she empathized so completely with Ofelia. Dawn had wanted to see this movie, given the title and buzz. In retrospect, we think she did fine without it -- but not that it was a bad movie or anything, just very violent (recalling her reaction to Lost City). Plus Dawn didn't much go for subtitles. The film explores very strongly motivated characters each responding to a different set of cues. The little girl is the most off base, in terms of having a solid enough reality to walk through walls (in a manner of speaking). The military patriarch is self-indulging in some father-son cult that glorifies in death, and he ends up disappointed. In between is the Spanish civil war, more than ugly. The maid's scenario is the most heroic, next to Ofelia's, yet tinged with more realism (more machine world, less Narnia). I'm not a huge fan of nuclear energy but recognize the technology is likely to stay with us, and could be less polluting than coal in some ways, once you factor in the scarring, although uranium mines can be ugly too. Iranian consortia are well positioned to lead in enrichment, a vital step in the commercial supply chain, provided there's sufficient transparency, given their relatively clean track record thus far. Civilian fuel providers will contract with Iranian refineries for ready-to-install non-weapons-grade materials. Given an historic insistence on secrecy coupled with a policy of first use, LAWCAP is in no position to be lecturing on the need for transparency in monitoring. Likewise, until the Grunch resolves its voting machine problems, it should maybe just shut up (in the Bill O'Reilly sense) about "exporting democracy." There's only so much hypocrisy an intelligent reader can bear. Those fearing competition in a lucrative sector face an uphill battle keeping the Iranians from breaking in to the business. USA-based flagships could remain competitive however, if complying with the same IAEA-style transparency guidelines as everyone else. Competition will help keep prices down and should be encouraged by the WTO. Any traffic aimed at nuclear weapons manufacture is equally criminal in every nook and cranny of the globe. That's easy to understand and therefore relatively easy to enforce. Americans talk about withdrawing from Iraq as if there were some place to go to get away from all mistakes of the past, from any consequences for what's been started. Vietnam to the west plays a role in this thinking, as Asia seems peaceful right now, nonthreatening (except maybe for North Korea). "Will Iraq ever be like Vietnam?" many North Americans ask themselves, scanning the channels for answers. Although North America pretty much stradles the northern western hemisphere, it's not immune from geopolitics, as our fearless leaders endlessly preach to us. But then do our fearless leaders have enough smarts to use a Fuller Projection, with world game models for winning against death by starvation, from exposure: twin terrors humans are naturally designed to fight. This karma is not all bad let's remember. Baghdad has a bright future on many a storyboard, Iraq a strong, self-interested economy. Just because we've earned a thousand years of karma doesn't mean we're in hell. We Fuller Schooler geekazoids like having to work it all out on tiny Spaceship Earth, find this a very kwel planet. We want our designs to be dependable, reliable, high quality. Speaking of which, it's time to go get Razz from the shop. Kudos to Southwest Airlines for juggling Alexia (and to Alexia for being a willing pin). The Chicago connection was about to fall through, and Seattle is too far to taxi, but an alert desk clerk realized a certain aircraft ended the day in Portland, so if Alexia just sat it out, passing through places like San Diego and Phoenix, she'd make it after all, which she did. No bag though. It came through Chicago, and I picked it up this morning with Larry, blathering in both directions about geeky stuff (they'd've delivered but why not a $50 voucher, a chance to catch up with a friend?). Anyway, great airline work. And kudos to Greg by the way. The mercy care team is also in high gear, performing its services. I just got off the phone with Ellen where she talked me through resetting the pump. Any TPN during hospice is a matter of landing the craft slowly and comfortably, less of a crash -- a shot of whiskey on the deck of The Titanic is how I put it (except Dawn was more a tequila fan, had given up drinking by the time I met her). Gayle and Elizabeth were her two pilgrimmage sisters on that trip to Ireland's holy wells that time. She also flew on her own to Glastonbury and those parts, that other time, meeting up with sisters there. Dawn was first introduced to the Kirby concept in the abstract. She was shown a small closet like room, told it was my office, while meanwhile Kirby himself was in Bhutan. Which was all true. Later, she and Alexia went to Bhutan with me, by way of Chang Mai (Thailand) and Calcutta (India). As for the Math Wars, they're always ongoing. Our side is winning these days, which hasn't always been the case. I prefer ending careers to real battlefield bloodshed -- more civilized by a long shot. Wanderers enjoyed some dynamite presentation by a Mercy Corps powerhouse this morning. I missed it, but all reports were positive. Glad to meet over Thai food with "our" Japanese exchange student (just turning 23) and her friend (same age -- I guessed right), bound for San Francisco today. I moved our wireless access substation from the bedroom to the living room this morning, so wayfaring guests, like our neighbor, might better access the Internet from Dawn's HQS. We've got a ship's log goin' (Laurie's idea), plus other stuff. The substation hangs off the house AC, which communicates tcp/ip over these short distances. It's funny to think of my browser frames traveling through the fuse box, but such is the state of the art in these parts. I told Wanderers I'm fine with like South Park doin' its version of the Al Gore movie or whatever, "because even if the science is right, the fear and/or spin might not be." The Windows patches worked fine, as did my satellite checked Casio, but for some reason the VCR box hooked to cable didn't update, even after unplugging/replugging during the move. And that clock's what I happened to rely on when I woke up this morning, so Tara was late to school. Again, I missed it, needing to catch up on office work, plus feeling feverish a little, having spent the previous night on the river on a stakeout of the moon. Glenn filled me in over Thai food: an accomplished engineer of vast environmental experience, Charles Lytle talked about how the instrumentation has gotten really good, to parts in a quadrillion sometimes, to where it's getting easier than ever to trace pollutants to their sources. This level of technical sophistication is a problem for the politically minded, who'd rather not see those detailed maps showing up on flatscreens all over the place. It's harder to just nod nod wink wink in the presence of so much empirical data. Polluting companies therefore can't simply arm twist, hoping their exotic pavement materials, or fireworks fallout, will go undetected and unreported. Still, despite these advances on the Sherlock Holmes side of the business, law enforcement has a tough job: rains from the other side of the Pacific often have a higher mercury content than local laws permit and overfishing hurts everyone, but how good are those eyes in the sky at really catching those heinous criminals, especially on cloudy days? 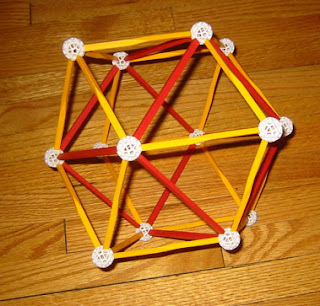 Koski is the David Letterman of T-module geometry, where the T-mod is this wedge, both left and right handed, and 1/120th of a rhombic triacontahedron. 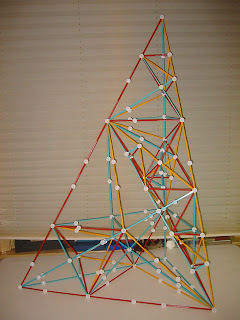 A recent investor in ZomeTool, David has been assembling up a storm. recursive construction of T with "remainder tet"
The other night, he reported finally getting around to the rhombic dodecahedron, the paradigm IVM shape, and finding it easy to build. Koski goes way back with this stuff, to the life of a scholar in and around Venice and Santa Monica, California, which is when we first met. My borrowed copy of Burden of Dreams coming due, I swung by Thirsters again while in the neighborhood. I partially caught up on a system for rationalizing English spelling, then tuned in a Reed College professor, ending up talking about R, which he uses to teach statistics, and J, which he hadn't heard of. The political analyst across the table talked up corruption in Cook County politics, about how they paid people to knock new voters off the roles, other shenanigans, and about how Senator Wu seemed so circumspect (inscrutable? ), despite recent press. Actually, I think Wu was somewhat on target characterizing neocons as Klingons, not Vulcans. Plus I take some credit (not a whole lot) for getting those trekkie monikers applied to brands of Washington insider in the first place. Nora came from a background in defense, as did DCI Deutch. Some of us called her "the Vulcan Queen" or something like that. She was a tough cookie -- smart too. But in calling her a Vulcan, I never intended Slatkin to be perceived as a neocon, who are more like Ferengi (I don't really see Condi as a neocon either though). All this Star Trek talk led a Thirster from LA to talk about being one of the very few privileged enough to get on the Deep Space Nine set. I'd been talking about how Kirk's chair in the Paul Allen museum would never pass muster on HDTV (you only need detail to the limit of scan line or pixel density). The Deep Space set was pretty detailed, but did contain Easter Eggs you'd never see on TV, such as Gilligan's Island lyrics on one of the space station's monitors (but "the real" Deep Space might've had those too, having a shared Earthian past). More remarkable were the garish colors. What you need to do with color, to make stuff look good on television, is kinda odd sometimes. Back to Thirsters, Lew assured me Gore's global warming road show rivaled the very best of the ISEPP lectures, and received high marks from the public. Lew compares Gore to Carl Sagan and Stephen Jay Gould, even if Gore's scientific credentials are more humble than theirs. Lew himself is way above average, in terms of being scientifically literate, but then he's a Wanderer. Speaking of Wanderers, Linus Pauling might be another role model, though I was assured yesterday that if you really took as much vitamin C as LP recommends, you'd generate some nasty Fe3+ oxidants, so better not. Fred was going on about how the Irish really took it in the neck for awhile. Worse than slavery, for awhile. More like The Gangs of New York. I also chatted with a musicians' union leader who thinks local radio stations should be required to devote at least a percentage of their air time towards advancing the careers of talented locals, i.e. by playing their music. If the airwaves really belong to the public, wouldn't that just go with the territory? In some parts of the country, finding enough talent to fill the slots might be a problem, but not in Portland certainly.